At first glance, I have to be honest, I didn’t think this little speaker was going to be very high quality. The speakers inside of it look like little tweeters and I didn’t think it would produce much sound. Also there’s no radio functionality (which I don’t even care about…and don’t know why I was looking for it in the first place). Then I stepped back and realized this is just a bluetooth speaker, not a job-site radio/stereo. I’m an idiot sometimes. The speaker does have an aux input in the side, as well as a usb port so you can put a thumb-drive in it and listen to your own saved audio files. I don’t personally use the speaker this way, because I have Spotify and build playlists and use the bluetooth feature sync’d to my iPhone. 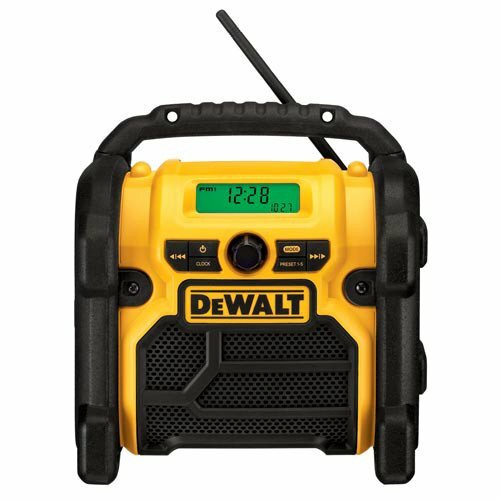 The speaker operates on any 20v Lithium-Ion DeWalt battery, of which I have several, and that includes the XR and FlexVolt systems! The amazing thing is that it hardly uses any battery power so I can use a 3ah battery all day, everyday, and it will last most of a week before having to swap out a new battery. The sound quality is not the greatest. I find that my JBL Flip 4 has a much lower and thicker bass range, so listening to hip-hop is far better with the JBL. This speaker is not going to blow your mind, but it will become your favorite speaker to use on job-sites. It’s only 3 lbs, and is roughly 5” x 8” in size so carrying it around with you everywhere is very easy to do. The DCR010 is designed to be the most versatile Bluetooth speaker on the market. 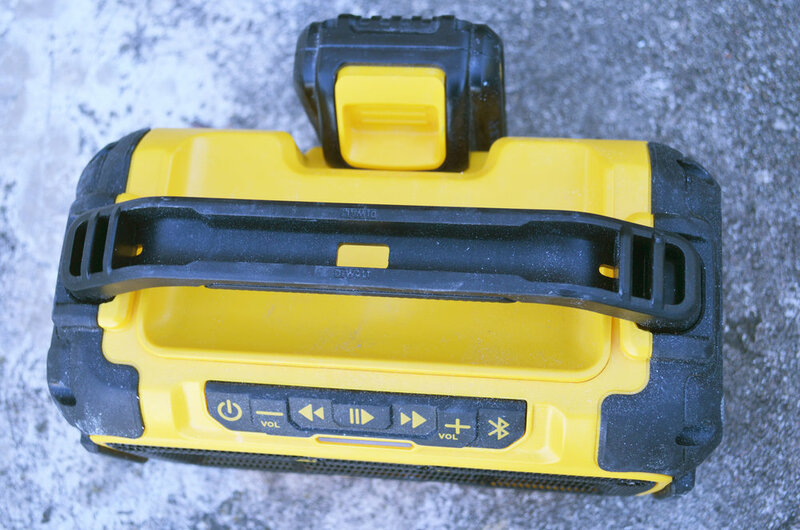 The unit is able to run off DEWALT slide pack battery packs including 12-Volt, 20-Volt, and FLEXVOLT packs. Can be run in AC current mode with provided power cord. I have started using this speaker as my MAIN source of music-listening throughout the day. 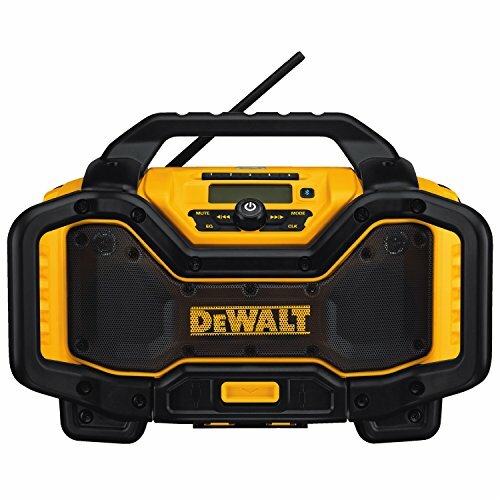 It doesn’t have the best bass because the speakers are so small, however it will get loud enough to hear on a noisy jobsite. I love that it’s portable, small, and lightweight, but most of all I love that I can swap out batteries with my drills and saws throughout the day and never experience any downtime without my music. I give this guy a 4.5 star rating; very impressive addition to my tool collection. 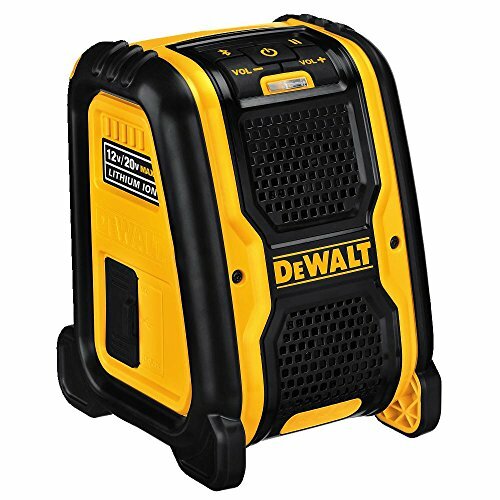 For more detailed information on this DeWalt Bluetooth Speaker CLICK HERE.